We are proud to announce Dockside Marine has been chosen as a Top 100 Dealer in the boating industry! Don’t miss out on our incredible selection of wakeboard boats for sale at our dealership near Houston, Texas. We are proud to be your premier full service boat dealership, you can find us on beautiful Lake Conroe in Montgomery, Texas serving our neighbors in Houston, Conroe, Galveston, and all of South Texas! Our incredible line of marine vehicles includes surf boats, pontoons, and more from manufacturers like MasterCraft, Misty Harbor, Bryant, Nautique and others! We firmly believe in delivering the ultimate boating experience for our customers, our goal is to share our dream of the boating lifestyle with you and your family. Our team represents the perfect combination of talent, experience, knowledge, dedication, and passion. Check out our boat showroom and then browse through our available inventory of new boats for sale or our affordably priced used boats for sale. Schedule a test drive and get out on the water in minutes, or if you’re already a boat owner, stop by our full service and repair department. We’ll make sure your boat runs like and a dream and is back on the water in no time! We strive to excel at all aspects of customer experience, including warranty, after sale service, and repairs. 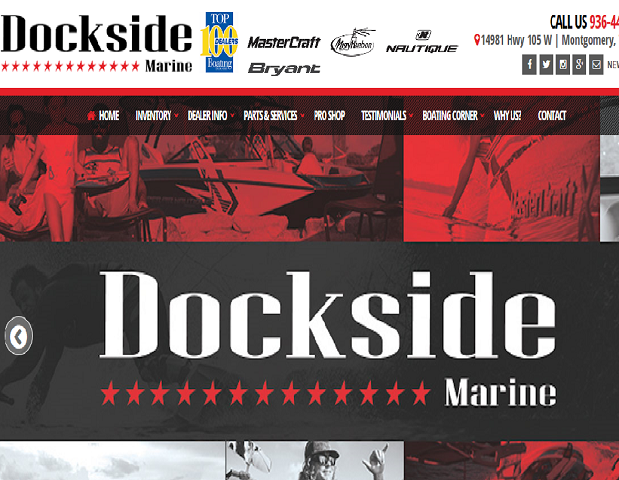 Our customers are members of the Dockside Marine family, so visit us today and welcome!